The following article was written exclusively for The Lake Norman Citizen Newspaper and printed in the January 22, 2014 edition. As president of the Lake Norman Chamber, I cannot adequately express how proud I am of the people from our community who step up to the plate and make this region a great place to live, work, and visit. Like the lake itself, these selfless acts send ripples across the face of our community and change lives in its wake. Last weekend, nearly 200 business and elected leaders packed The Peninsula Club to attend the Chamber’s Annual Meeting. It was a reflection of the past year as outgoing Board Chair Wendy Moran shared the accomplishments of our chamber and recognized key community leaders and volunteers. 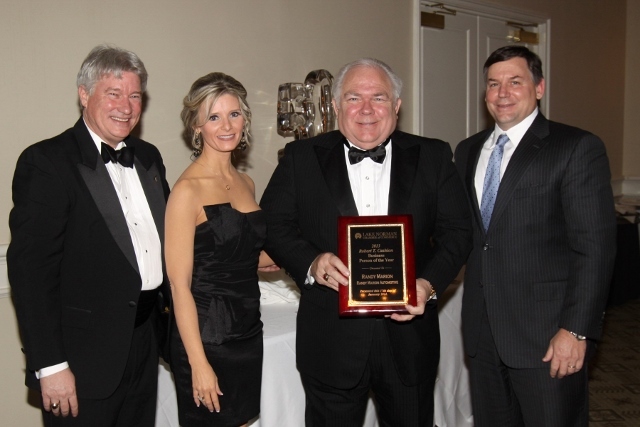 Randy Marion of Randy Marion Automotive receives the Lake Norman Chamber Cashion Business Person of the Year. 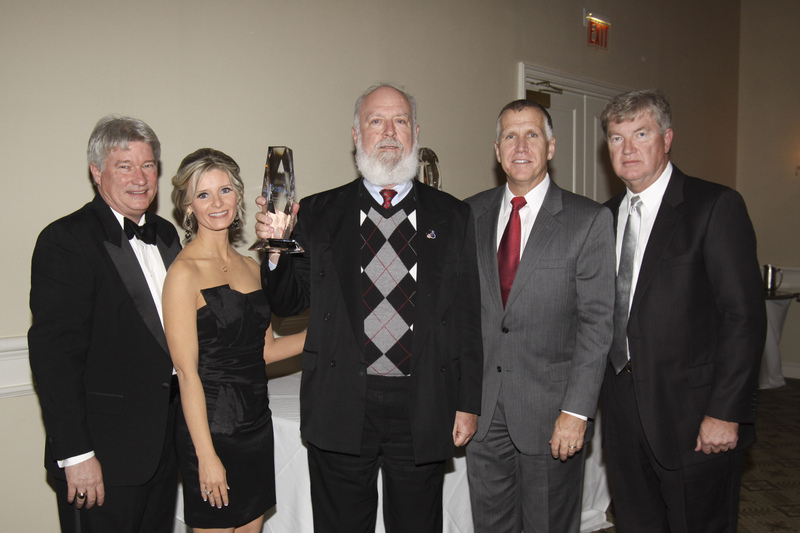 Pictured are: Chamber President Bill Russell, Chamber Board Chair Wendy Moran, Randy Marion, and Bobby Cashion. Photo courtesy of Deborah Young Studio. Randy Marion was selected the Business Person of the Year. His dealership excelled in 2013 and Marion was recognized nationally as the #1 Business Elite Dealer in the nation. Jim Engel, president and CEO of Aquesta Bank, was acknowledged with the Spirit of Entrepreneurship Award. In addition to their business success, Marion and Engel have contributed greatly to their communities. Each has been recognized by the March of Dimes for outstanding leadership. 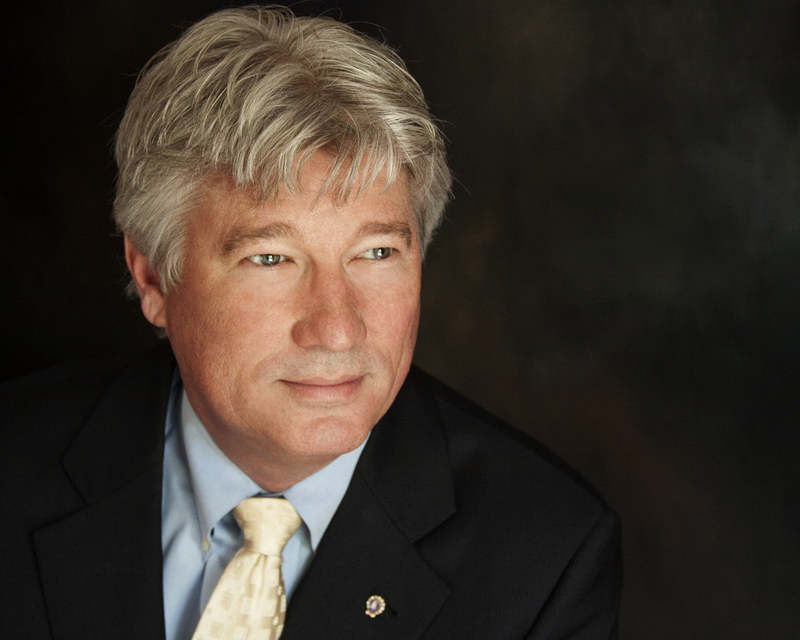 Marion is also involved with the Mooresville Soup Kitchen, the Piedmont Council of Boy Scouts, and currently serves as Chairman of the Board of Lake Norman Regional Medical Center. Engel is a strong supporter of Big Day at the Lake, the Ada Jenkins Center, the Dove House and the American Red Cross. While the Chamber’s gala was a time to reflect and celebrate, there were few dry eyes in the crowd when the staff of Business Today was awarded the Distinguished Service Award. Literally fighting for his life, Business Today founder Dave Yochum spent half of 2013 facing a series of health challenges. Dave is not only the hands-on leader of two newspapers, he is the founder of Big Day at the Lake and the Top Women in Business program. During the past year, when Dave was unable to lead the projects himself, the staff of Business Today, as well as a number of community volunteers, made sure those programs met and exceeded the bar of success that Dave set in prior years. One of our chamber members approached me with tears in her eyes. She hugged me and thanked the chamber for reminding her why she and her husband chose the Lake Norman region to live. Her comments and those just like hers that I get to hear on a weekly basis serve as a constant reminder of the impact we all make working together in a common cause. As the presentation of awards concluded, the Duke Citizenship and Service Award, was presented to Angels of ’97, a completely volunteer non-profit serving the entire north Mecklenburg area. It was created by former Huntersville Town Commissioner Charles Guignard, shortly after the death of two high school students, who perished in a tragic auto accident in 1995. To date, the organization has provided 152 scholarships to local high school students raising a little over $500,000. Angels of ’97 now offers a ministry group to console families who have lost children. They hold monthly meetings for family members to share, reflect, and support one another. Charles Guignard, founder of Angels of ’97, receives the Duke Energy Citizenship and Service Award. Pictured are Chamber President Bill Russell, Chamber Board Chair Wendy Moran, Charles Guignard, NC House Speaker Thom Tillis, and Tim Gause. Photo courtesy of Deborah Young Studio. Like the angels they honor, these volunteers serve up spaghetti dinners for scholarships. They care for those who need comfort and consolation, lending a helping hand when times are tough. However, you will not recognize them by the wings on their back but by the smiles on their face and the love in their hearts. They are all God’s gift and a reminder, as a community – our Lake Norman community, we are never truly alone.